Ms. Freeman founded the Maryland Talent Education Center in 1994. She is very active as a performer, teacher and entrepreneur. From 1987 to 2012 she was on the faculty of the preparatory division of the Peabody Institute where she taught violin and group classes. She created, and from 2002-2011 directed, a highly successful Suzuki strings program at the first charter school in the state of Maryland, the Monocacy Valley Montessori Public Charter School. In addition to her administrative and teaching positions, she is the principal viola for the Maryland Symphony Orchestra and a member of the National Philharmonic. Ms. Freeman is also the founder and CEO of Molto Legato, LLC a company which manages content creation and social media and marketing strategies. Her latest venture is a website to support students, teachers and parents in learning to play and teach the violin. Please visit www.ViolinPractice.com to view this exceptional resource. Jonathan Terry earned a Bachelor of Music degree from Peabody Conservatory and Master of Music degree from the University of Delaware. Jonathan grew up as a Suzuki student and utilizes that method with his students with the addition of scales and traditional etudes. 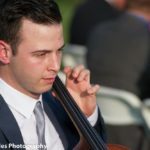 He is a past winner of the Columbia Orchestra competition and has attended the Tanglewood Institute in Boston. Jennifer Houck, 25, is from Middletown, Maryland. She began studying the violin at age 7. From the age of 7-17 she studied with Phyllis Freeman at the Maryland Talent Education Center. Following that, she studied with Dr. James Stern at the University of Maryland, where she graduated with her Bachelor of Music in Performance degree in 2008. Most recently, Jennifer has been attending Carnegie Mellon University, where she graduated with her Master’s in Violin Performance under the tutelage of Andres Cardenes. She has attended summer festivals at Encore, the Heifetz Institute, Meadowmount, the National Orchestral Institute, the National Repertory Orchestra, and Eastern Music Festival. She has studied with many teachers from different colleges and conservatories including David Updegraff, Shirley Givens, David Salness, Marjorie Bagley, and Christopher Wu, as well as participated in master classes with Andrew Manze, Mimi Zweig, and Elizabeth Schultz. Megann Greenlees is originally from Maryland and is a graduate of the Maryland Talent Education Center. 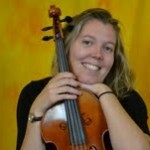 She has bachelor and master degrees from the Cleveland Institute of Music in viola performance. During her time at CIM, she studied with Jeffrey Irvine and Lynne Ramsey and became Suzuki certified in Books 1-10 on violin with Kimberly Meier-Sims. She has played in several regional orchestras in Ohio, including Akron Symphony, Canton Symphony, and Erie Philharmonic. Ms. Greenlees was also a member of the Black River String Quartet (quartet-in-residence at Lorain County Community College). 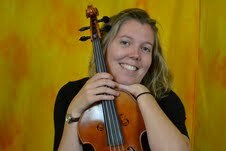 From 2009-2012 Megann taught private violin and viola lessons in the Lakewood middle and high schools. Megann has attended Cleveland State for the past 2 years to receive a degree in music therapy and is now a certified music therapist.